One of the most enduring questions in the shooting community remains: "What's the best gun for concealed carry?" People ask me this question all the time and my answer has become more refined over time. For years, rather than suggesting a specific brand or type of handgun, I answered with another question: "Well, what are you looking for in a carry gun?" As any first-year law school student can tell you, answering a question with another question is often manipulative and misleading. Most likely, the person asking about the best carry gun doesn't even understand (at no fault of their own) what to look for in a good carry gun, and the conversation becomes immediately unproductive for both parties. Like medicine, prescribing the best gun varies from one person to another, and there's no universal remedy for every patient. It doesn't matter if you're recommending firearms, food or cars, try using inductive reasoning when giving advice. Inductive reasoning allows you to make decisions based upon facts, patterns, observations and testing. Since recommending a carry gun is very subjective, it's difficult to quantify or define a specific gun for any one individual. That's when it helps to use a process for guiding someone to their ideal carry gun. All of these factors require the individual to make informed decisions about the gun they may consider carrying. Applying each "C" factor forces the person to analyze their own level of experience with specific firearms, as well as identify personal preferences and body type considerations. This way, we're using observations, patterns and testing to draw conclusions about carry guns, rather than just pontificating one type of firearm or brand. Remember, you can't defy gravity or physics. Each of these factors are closely related, and trade-offs abound. One pistol might Conceal very well, but it may not offer enough Capacity for your preference. Long story short, analyzing the five "C"s promotes logical decision making. So let's take a moment to think logically about each of the five factors. The goal is finding a carry gun with a reasonable balance of all five factors. 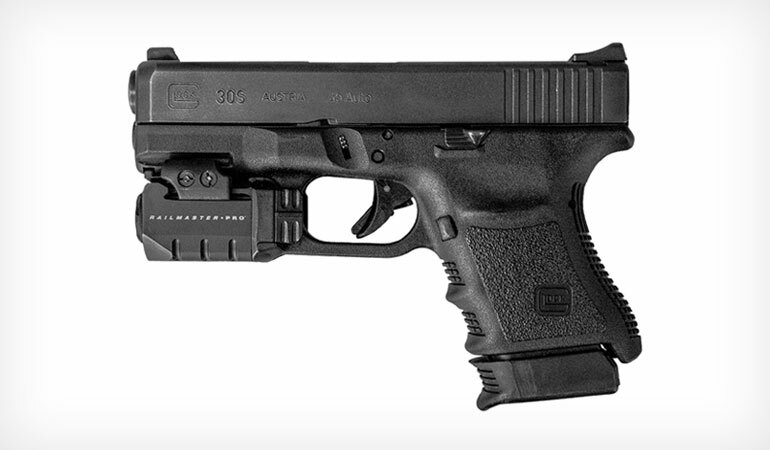 As an example, we'll apply each of the "C"s to the Glock 30S (pictured here) to analyze its merits for concealed carry. How much do you want to hide the gun? What's the most comfortable carry method for you? This is based largely on personal preferences and specific state laws on "printing" or "showing." You'll need to identify how the person intends to carry the firearm. Will it be primarily carried inside the waist (IWB), on the ankle, in the swell of the back, appendix style or using another method? Body type often determines preferred methods, as people will carry a larger or smaller gun based on how well they can physically conceal it. Some guns will conceal well in several methods, while others are limited. For example, Dirty Harry concealed a Smith & Wesson Model 29 in his sport coat with a shoulder holster, but he'd be hard pressed to carry that gun on his ankle. It's also important to understand the various firearm action types, as each have advantages and limitations for concealed carry. For example, a semi-auto pistol with a single stack magazine will likely conceal better than that of a double stack, due to obvious mass and bulk considerations. However, the single stack usually has a lower Capacity than a double stack. In terms of this Glock 30S configuration, concealability might be an issue. With a double-stack magazine holding 10 rounds of .45 ACP combined with a Crimson Trace Rail Master Pro, this gun is heavier and bulkier than other options. However, a custom-molded IWB holster from Theis Holsters allows this larger Caliber gun to be carried in a comfortable and Concealed manner. Could you defend your life in a moment's notice with your chosen carry gun? First, determine the person's experience level with various firearms. Have they ever shot a semi-auto before, or do they favor revolvers? What's the most powerful handgun they've ever fired? Have they ever fired a compact or subcompact pistol? If they want to carry one type of gun for various reasons but haven't shot it yet, try renting that firearm at a gun range. 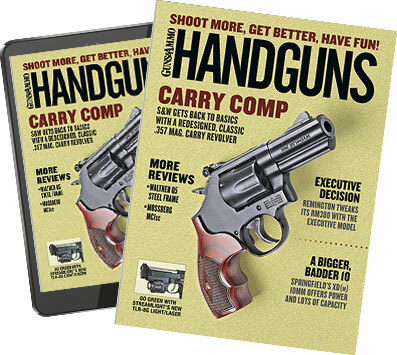 To develop enough confidence to carry it, significant dry-fire and live fire practice sessions are suggested before carrying. Developing muscle memory is essential to properly Control any firearm. If someone wants to carry the pictured Glock 30S, they need to be confident in their abilities with a compact, striker-fired semi-auto. They also need to be confident with its Concealment restrictions, Caliber, and the operation of the light and laser. Any areas where the person is not confident must be practiced before carrying. With Confidence, this gun is a very effective defensive weapon. Control is largely based on all five factors. Is the person capable of manipulating the controls? Can they handle its recoil? Can they consistently put rounds on target with that firearm during a stressful situation? When choosing a controllable carry gun, it's very important to understand how to pick a handgun to fit your grip. Find something that fits and stick with it through practice sessions to develop muscle memory for greater control. It's also equally important to understand how Caliber and recoil affect Control. One person may be able to make fast, accurate shots with a 10mm or .45 ACP, while another person can better control a .380 ACP or 9mm. Determine what you can safely handle by starting small and working your way to larger calibers. Remember, the short barrels on most carry guns tend to make for snappy felt recoil and reduced control. The .45 ACP Glock 30S has a considerable amount of felt recoil. However, its grip surface with a magazine extension allows the shooter to get a solid purchase on the grip for added Control. It also has a low bore axis, allowing the shooter to get their sights back on target quickly after recoil. How many rounds will it take to neutralize the threat(s)? You'll never know until the time comes, and that's why we typically side with greater ammo capacities. Additional capacity is your best friend when multiple assailants are involved. Practice drills can help illustrate how many rounds you might need in a stressful situation. Practice drawing from concealment, shooting on the move, shooting from cover and shooting from inferior positions. You'll quickly find that mixing reloading time with any of these drills greatly increases the challenge. Capable of holding 10+1 rounds of .45 ACP, the Glock 30S can deliver substantial firepower without reloading. It will also accept 13-round magazines from the Glock 21, making for a great backup magazine. The drawback? Don't forget about the significant weight and dimensions of carrying an 11-round, double stack .45 ACP. Arguments over the best caliber are historically as broad and opinionated as picking the best carry gun. Nonetheless, it's an important choice that's becoming easier to make. Thanks to the effectiveness of modern defensive ammunition, it's becoming easier to neutralize a threat with smaller calibers. Many of the "caliber war" arguments are based on terminal ballistic data from military ammunition. Because the military largely uses non-expanding full metal jacketed (FMJ) bullets, it's difficult to compare those arguments to expanding defensive ammo in civilian applications. Advancements with commercial 9x19mm ammunition make it a very realistic option for concealed carry. Regardless, if you can Control a more powerful handgun chambered in .40 S&W or .45 ACP, then by all means go big or go home. The Glock 30S packs a .45 caliber bullet that is capable of delivering serious expansion and hydrostatic shock. However, this handgun might not be Controllable for all users, due to its compact size and big bore. In that case, develop Confidence with a .380 ACP or 9mm and re-evaluate using a more powerful cartridge after becoming proficient with less powerful loads. Recommending a carry gun for someone is a very difficult and subjective task. It's important to understand several factors, including their personal preferences and experience with firearms. When someone asks, "What's the best gun for concealed carry? ", walk them through the five "C"s of concealed carry. Choosing the right gun is a game of trade-offs, and the end results are different for every individual. Each of the factors are inter-connected, and one affects the other in almost every step of the process. Is the Glock 30S the best handgun for concealed carry? It's one of my favorites but it's certainly not the answer for everyone. Knowing the five "C"s will make you sound like an expert, and in the process your buddy might just invite you to the gun range the next time he decides to rent a handful of guns to test out. I don't know about you, but I rarely turn down the opportunity for additional trigger time with new guns and good friends. For more information on choosing a carry gun that's right for you, learn about personal carry philosophies in this episode of Handguns & Defensive Weapons TV on the Sportsman Channel. Below the video, we also discuss 5 great concealed carry practice drills.